Rumors on the Internet tell of an impending asteroid strike which has been said will take place in late September between the 22nd and 28th, striking somewhere near Puerto Rico in the Atlantic Ocean. Although the rumors really are just that — rumors, some are still concerned. Some conspiracy theorists believe that governments-of-the-world are already aware of an impending strike which could quite possibly trigger an “ELE” (Extinction Level Event) and are currently concealing the information from the populace. Interestingly enough and dovetailing with this we see that the Russians have been closely monitoring several objects over the past year or so which are headed toward earth. If the object deviate their trajectory enough, while passing through the gravity wells of other planets in our system, they could possibly strike earth in the future as reported by RT earlier this year. However, sadly, whichever way you slice it, we are defiantly past due for an asteroid strike upon the earth. Additionally I want to mention that one of my military connections, stationed in Hawaii, told me that the U.S. Government has shot down so many asteroids over the past few years that the planet would have already been impacted 10 times over without the technology. While I can not verify my source’s statements to be true, it’s worth noting here and now. 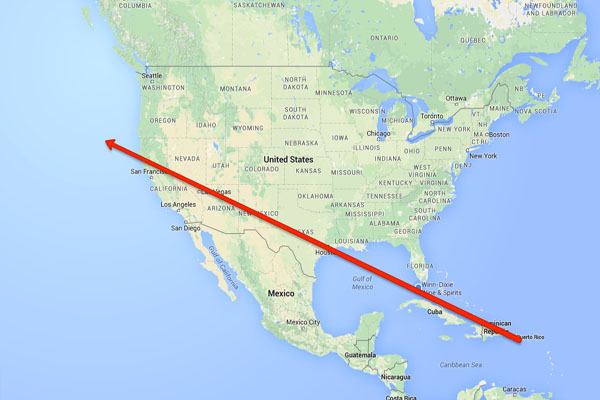 To boot it’s also important to point out that if you draw a line directly from the said asteroid impact zone near “Puerto Rico” directly through the center of the original JADE HELM states a potential flight path, impact swath emerges. While this is all just speculation at this time, let’s log this here and now as a possibility. We also have to ask ourselves what FEMA and the Department of Homeland Security have been gearing up for, purchasing millions of dollars worth of meals ready to eat, water, and supplies, along with billions of rounds of ammo for use domestically.